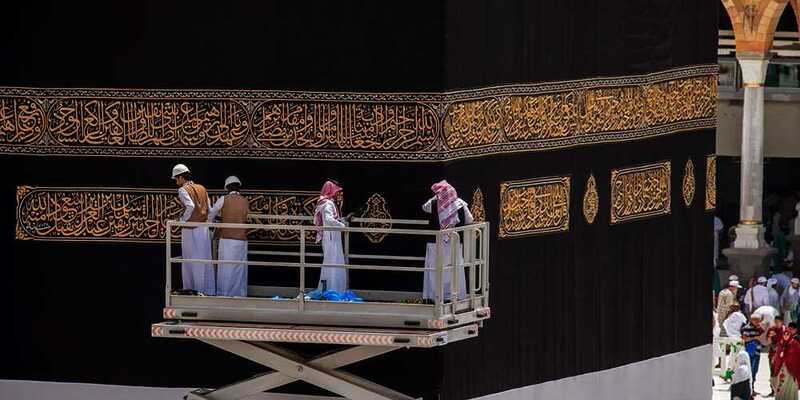 The annual ritual of changing Kiswa (Ghilaf-e-Kaaba) held in the early Monday morning in Saudi Arabia, where millions of Muslims have gathered to perform the Hajj. The holy Kaaba is dressed in its new Ghilaf on 9th Zilhaj (i.e) the Day of Arafat every year after Fajr prayer. The new Kiswa has been prepared with an estimated cost of 200,000 Riyal. It is woven from 670kg pure silk fiber, embellished by 120kg gold and 100kg silver-plated thread illustrating verses from the Holy Quran.